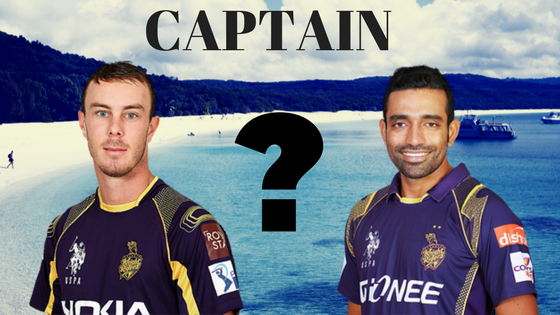 Who Will Be The Captain Of KKR For IPL 2018? Kolkata Knight riders have always been one of the most popular franchises in the IPL because of the stardom, as Bollywood superstar, Shah Rukh Khan, Juhi Chawla and her husband Jay Mehta owns the franchise. Being one of the best competitors in IPL they have won twice in 2012 and 2014, under the captaincy of Gautam Gambhir. Before that they haven’t won for the first four years of IPL, it was a big struggle for them. The franchise definitely got boost up after winning 2 sessions of IPL. By defeating Chennai Super Kings in 2012 and Kings XI Punjab in 2014. Gautam Gambhir has been the best captain for KKR till 2017. But for IPL 2018 he is not Captain, as he is not on the team this year. Gautam Gambhir himself asked KKR not to retain him. This year he got picked up by Delhi Daredevils for Rs. 2.8 crore. Now, who will be the Captain of Kolkata Knight Riders for IPL 2018? The team Coach Jacques Kallis and the entire team has got a challenging job to do. Here is the list of players according to their performance and records who can lead the team. Let’s see how they have been till now. The current captain of Brisbane Heat and got the player of the tournament for making 309 runs in the five games at the average of 154.50 and strike rate of 177.58. He gave an outstanding performance in Big Bash League, showing that he can lead a team. Lynn played for KKR in 2014 and last year, where he performed very well. He is known as a big hitter, who has also played for Caribbean Premier League and Sri Lankan Premier League. But his frequent injuries might be a concern for the team. Kolkata Knight Riders purchased Dinesh Karthik for Rs 7.8 crore for the IPL 2018. Last year he played for Gujarat Lions and he had performed well in all the IPL, while played for different franchises like Delhi Daredevils, Kings XI Punjab, and Royal Challengers Bangalore. The best part for him to get selected as a captain is, he had being captain of Tamil Naidu Trophies Ranji team. He was also a vice-captain for Delhi Daredevils in IPL 2017. He is playing for Kolkata Knight Riders since 2012. He is one of the best spinners on the field. This Caribbean got the player of the tournament for taking 24 wickets at 5.47 runs per over. He has a good hand for those 2 IPL wins of Kolkata Knight Riders. If no one else he could be the captain or vice-captain for the squads. He has been one of the most consistent players for KKR since 2014. He has scored tons of runs for the franchise during these years. Although he doesn’t have any domestic captaincy still his long-term relation and consistency in his performance may work for him. Earlier in this auction, he was picked up by Chennai Super Kings for the price of Rs 4.2 crores. But he got retained by KKR using RTM option. He has rewarded the franchise with his leg spin bowling. He doesn’t have any domestic captaincy experience but his association with KKR may help him to become the captain. These are the 5 Player fit for the job of captaincy, according to their experience. Let see, hope the best one gets to lead the Knight Riders for IPL 2018.